Start by growing the ingredients for your favorite recipes and beverages. Consider those, like tomatoes, that taste best fresh from the garden. Or create a salad bar by filling window boxes and raised beds with greens, hot peppers, green onions and more. Just hand your guests a plate and let them create their own fresh salad. Dress up the table or balcony with a few containers of herbs on your patio, deck or near the grill. Use small herb containers as edible centerpieces. Just include a pair of garden scissors and allow your family and guests to season the meal to their taste. 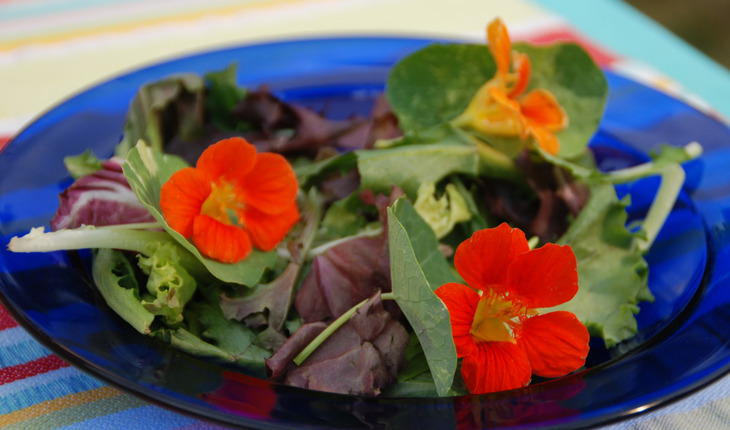 Add a bit of color to your meal with edible flowers. Try nasturtium and daylily blossoms stuffed with cream cheese, calendula petals sprinkled on your salad and mint leaves a top a slice of chocolate cake. Include a few herbs and vegetables that can be blended, muddled or added to your favorite beverage. Use the hollow stems of lovage as a straw for your tomato juice or bloody Mary. You’ll enjoy the celery flavor this edible straw provides. Or pluck a few mint or rosemary leaves to flavor iced tea and lemonade. Just be sure the vegetables and flowers you select are free of pesticides. Remove the bitter tasting pollen from edible flowers. Start your party preparation in the garden. Once you compile your list of favorites prepare your garden and containers for a productive growing and entertaining season. In the garden, add several inches of organic matter such as compost to the top eight to twelve inches of soil. You’ll improve drainage in clay soil and increase the water holding ability in sandy soils. This is also a good time to incorporate an organic nitrogen fertilizer, like Milorganite into the soil. This slow release fertilizer provides needed nutrients for six to eight weeks. Then be sure to add a mid-season boost to keep your garden healthy and productive. For container plantings, select a pot with drainage holes and fill it with a quality potting mix. This is also a good time to add an organic nitrogen fertilizer which will eliminate the need for weekly feedings. Just give containers a second application mid-season. Mulch the soil with shredded leaves, evergreen needles or other organic matter to suppress weeds and conserve moisture. As the mulch breaks down it improves the soil for future plantings. Harvest regularly to keep your plants looking good and producing. Cut the outer leaves of leaf lettuce when four to six inches tall and it will keep growing new leaves. Pick peppers and tomatoes when fully ripe, so the plant continues flowering and forming new fruit. And dress up the table with a bouquet of your favorite garden flowers. Pick a few extras to send home with your guests and they’ll surely remember your special gathering filled with homegrown flavor and beauty.